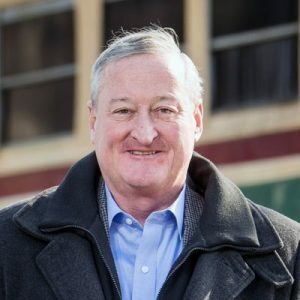 Philadelphia Mayor Jim Kenney officially announced his intentions to seek a second term through a social media announcement on Sunday. The two minute long video about his re-election bid centers around school funding in Philadelphia as a way to combat poverty. “If all of our children, given the right attention, and the right resources can break out of poverty, in a generation we can eliminate that or limit and reduce it substantially,” Kenney says in the video. It’s been my honor to serve the people of Philadelphia — and I’m excited to announce that I’m running for reelection! The video also features Philadelphia City Councilwoman Cherelle Parker echoing the sentiments of Kenney. “The zip code that you live in, should not determine whether or not you value yourself and your community,” Parker said. At the moment, Kenney is set to face at least one primary challenger. Former Philadelphia City Controller and state representative Alan Butkovitz announced his bid to challenge Kenney in November. Butkovitz has been vocal in his opposition to the controversial soda tax. The Inquirer has reported in recent months that state Sen. Anthony Williams (D-Philadelphia) is also “seriously” thinking about making a bid for Mayor after he finished second to Kenney in the Democratic Primary in 2015. There are two Republicans seeking their party’s nomination for Mayor as of now. South Philly defense attorney, Billy Ciancaglini, and Republican Ward leader for the 16th Ward, Daphne Goggins have officially jumped in the race. Kenney SUX, vote Zakrey for Mayor! Plz just remember him dancing about sanctuary cities. Like…supporting them, I disagree with, but plenty of people support them without looking like a complete idiot. R u dumb? The poor and middle class in Philly now have a choice. Support the current mayor who hates you, or support a new mayor who does not.